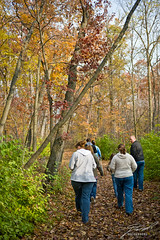 On a Sunday afternoon a few weeks back, the weather was too nice to stay inside, so we opted to play hooky and run over to the Burgess-Shadbush Nature Center for some geocaching with friends. We had started toward the first of the two caches we were to hit in this portion of the park only to discover that we had to turn around and take the lower trail. Oh well -- at least it's a beautiful autumn day.